Download SoraCart Shopping Blogger Template is a premium looking and professionally designed magazine blogger theme. 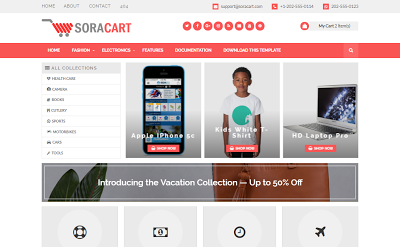 Sora Cart Blogger Template is a perfect fit for building a fully functional online store. Sora Cart has a large banner for you to showcase your hottest and newest products to immediately catch your customer's attention. Information blocks are nicely and neatly display for your customers to easily find the information they need. Sora Cart Blogger Template will bring a power for you to transform your dream shop into a magic digital outcome is limitless. Let Sora Cart flourish your business and reach your full potential today. Download Free SoraCart Shopping Blogger Template is a premium looking and professionally designed magazine blogger theme.